During Georgie's episode we had, what could be described as a mini mutual appreciation society for kedgeree. Georgie said her mum makes the best, but I always thought my mum did, which I think means it's one of those classic home cooked dishes that just oozes comfort and homeliness. Georgie says she doesn't eat kedgeree that often now, but when she does it's one of her all time favourite desert island dishes. 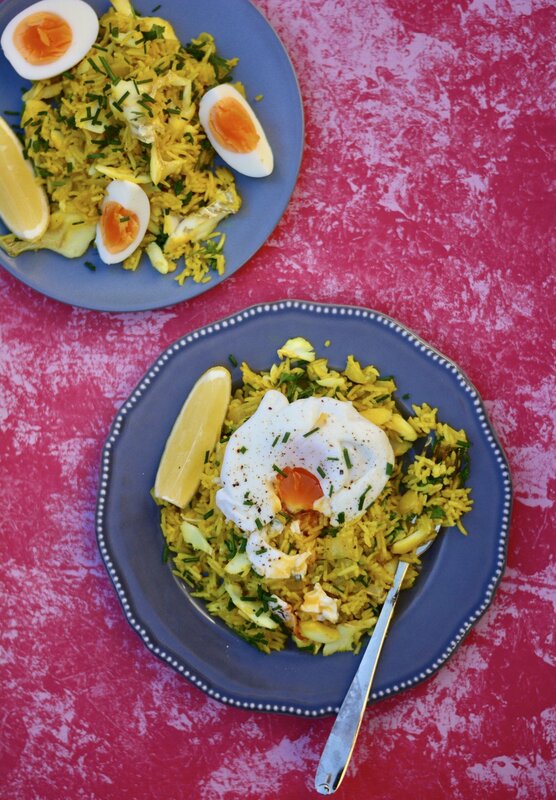 I don't know about you but I often forget just how good kedgeree is, and then I have it again, usually cooked by my mama and suddenly I'm obsessed with it all over again. Whilst schlepping all over Scotland cooking in lodge after lodge I loved making kedgeree for breakfast. It's the traditional way to have it, and on a cold and blustery morning it makes the perfect way to kick off the day before heading out onto the hills. It feels so decadent and somewhat Downton Abbey-esque. It's always a somewhat surprising crowd pleaser, which also means it's a great dinner party dish for when you've got friends over for Friday night supper. 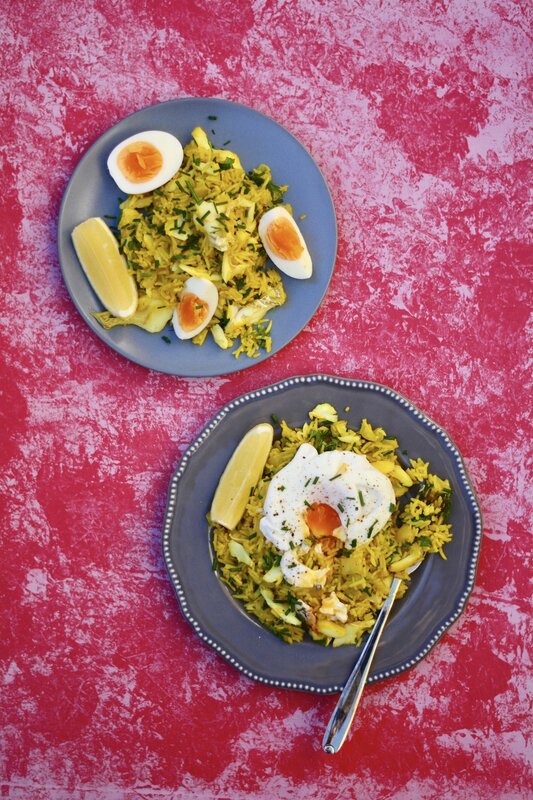 Bung a pot of kedgeree on the table in front of your friends and watch their eyes light up. Add a crunchy green salad with a simple vinaigrette on the side, and hey presto. In my world, if in doubt pop an egg on it. So whilst I love serving these with boiled eggs, I also love them with a poached egg on the top. Truth be told, I almost always go double egg and roughly chop the boiled eggs and stir them through and then serve them with a poached egg on the top. Judge me if you will, but there it is. Don't forget the wedge of lemon on the side and a sprinkling of chives, yes they help to make the dish look pretty but they also add little pockets of flavour which is important too. Start by boiling your eggs. Simply boil the eggs in boiling water for 8 minutes, and run under cold water to stop the cooking process. Peel when cool enough to handle and set to one side. Now you can get on with cooking your fish. Simply boil some water in a large shallow pan and add the smoked haddock. Simmer for only about 5 minutes or until the fish is cooked and flakes when you touch it. Remove the fish from the water and set to one side. Cover with foil to keep the fish warm. Don't throw the water away - you are going to use it to cook your rice. Melt 50g of butter in a large heavy bottomed pan (with a lid) and then gently fry the onion until soft but not coloured. Low and slow is the way. Season and add the curry powder and tumeric and give it a good stir. Add the rice and 1 litre (1 3/4 pints) of haddock cooking water. Bring to the boil and then pop the lid. Cook for roughly 12 -15 minutes until the rice is cooked and is tender when you taste it. Flake the fish and add it to the rice, stir in 50g butter, the chopped parsley and the chopped boiled eggs. Serve with a wedge of lemon and a sprinkling of chives. If you want to make like me, simply pop a poached egg on the top.